BlackBerry PlayBook: Where Is It's Market Niche? 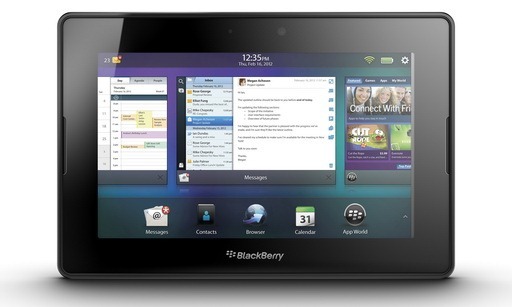 BlackBerry PlayBook: Where Is It’s Market Niche? Over the past five weeks, since the launch of Playbook OS2.0, I have been using the BlackBerry PlayBook as my primary tablet to see if I can carry on my normal “roaming” activities. This comes after a year of using an original iPad, which I have found to be the equivalent of an “electronic briefcase”. Over the past three years the device I take away from my home office for day trips has gone from a 15″ Dell Inspiron to a MacBookPro to an iPad; and now to trial a PlayBook. While iPad dominates the tablet market in this role, we have started to see the emergence of purpose-based tablet platforms in new scenarios. The Amazon Fire, builds on Android to offer a color eReader with a focus on reading books, journals, etc. as its primary application. TelyHD is a Skype for TV platform, again built on Android, with a focus on making and receiving Skype calls from any HDTV; it has the potential to become a “tablet” for the TV as they add new applications such as document sharing. Galaxy Tab 10.1 is appearing as a complementary device to other products – for instance it comes as the manual for a couple of automobile lines, it’s offered by a local furniture chain if you purchase enough furniture, it’s offered by Rogers if you buy their top-of-the-line Netbox cable TV/Internet subscription. Last Thursday RIM released quarterly results with a firestorm of press coverage leaving the public somewhat confused. But what the press has not experienced is using the PlayBook. In a follow up post I’ll comment on the business aspects in a future post but want to set the stage with my PlayBook experience. 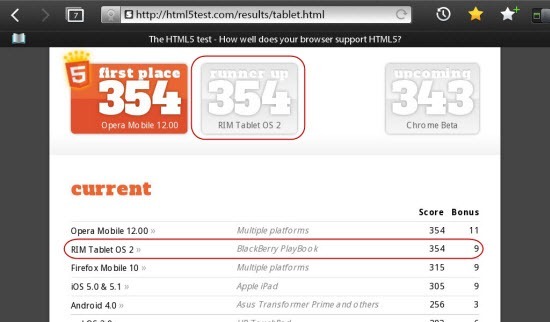 And getting PlayBook 2.0 launched was the first benchmark in my post immediately after the recent CEO change: RIM and BlackBerry: Benchmarks for Progress. Size matters. I can put the PlayBook into my ski jacket and blazer pocket without the need to hang it somehow from my neck to remain hands free while walking. And of course, it’s one of the lighter tablets. Size will become an issue in the tablet market, depending on the level of convenience sought. Email: Playbook OS 2.0 marked the arrival of an email client on the PlayBook; in fact it goes beyond email to encompass social networking messages in Twitter, Facebook and LinkedIn. From a user interface perspective, it is the best messaging application on a mobile device that I have experienced. With PlayBook, the emails are just there and always updated as long as the PlayBook has had a connection. Tap on an email header in the left sidebar and its content is there immediately – in full color, if appropriate. 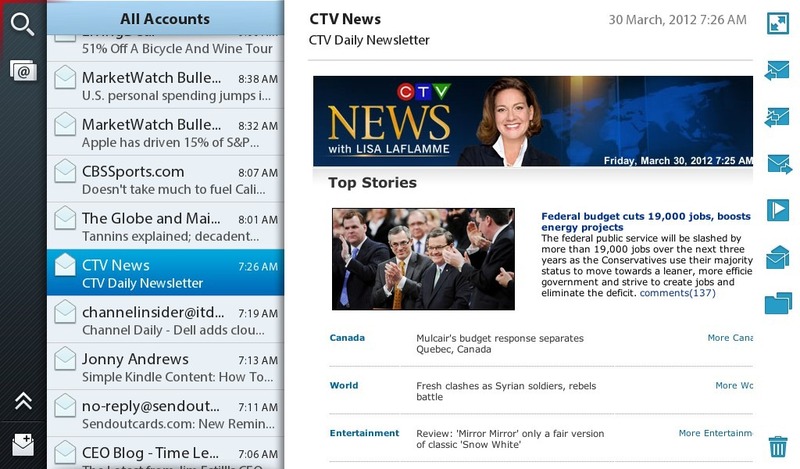 Having a sidebar on the left listing the emails (equivalent to Outlook’s Compact View) and simply touching on a header to view the content on the right is a much simpler process than having to go back to the Inbox to find other emails. One other neat feature: it allows you to easily follow message threads in a natural way. That little red marker in the upper left is one very useful feature. Whenever a new message arrives that red marker subtly appears while in any application or on the Home screen. Simply swipe down from the corner and it tells you how many are there; tap on the “envelope” icon that appears and it goes to the Messages window. My one complaint about the overall Personal Information Manager is that Contacts and Calendars only synchronize to Outlook if you are using Microsoft Exchange. In my case with a stand alone Outlook configuration, RIM still needs to provide direct synchronization with the Outlook client; in the meantime it is very good at picking up Contacts information from Facebook friends. Of course I can see my Outlook Contacts information via BlackBerry Bridge which basically mirrors the PIM information on my BlackBerry which synchronizes to my Outlook. This issue has not been a major one with respect to using the Messaging and PIM features. Video: It’s a 1024 x 600 display on a 6” x 3.5” screen; yes, it’s about half the pixels/sq. in. of the “new” iPad but it’s a significant improvement over any early generation tablet. And its crisp, rich color depth is definitely noticeable. Click on the email screen display above or the image below to go full size; even then I’m not sure a PC display can capture the full impact and crispness. The rear camera can capture 1024 x 640 photos and 1080p video. During a recent visit to the Niagara Falls Butterfly Conservatory there was an opportunity to capture a one minute movie of color in motion using the 1080p rear video camera. It includes the ability to upload video to YouTube directly from the PlayBook. One more example of the benefits of multi-tasking: When I have not visited my email on the iPad for a few days, let’s just say there’s a bit of an exercise to get my email updated. On the other hand whenever I go to email on the PlayBook, it’s always up-to-date, even if I have ignored it for a day or two. This probably results from a combination of RIM’s push technology and multi-tasking – bottom line is that, unless the device has been disconnected from the Internet, email is always current. Another example: one can keep up to date with real time scoring at PGATour.com on the PlayBook browser whereas the PGATour application on the iPad can lag by up to an hour, even when it’s the foreground app. Real time is critical when these tournaments are changing the Leaderboard every few minutes, especially on the last nine holes of a tournament. Clicking on the tweet on the right above leads to a YouTube video that gives an excellent demonstration of PlayBook’s true multitasking capability. Bottom line is that PlayBook is the first mobile device where I have no qualms about routinely using the browser on the device, especially when using the browser version of applications where there is no dedicated Playbook application, such as Dropbox and GMail. The combination of speed and support of Flash make a difference. BlackBerry has always had superb stereo audio on the native device. For the Playbook there are speakers and microphones on both sides of the device providing a true stereo sound. Of course there is also a 3.5mm jack for headsets. Using an App World application, iTunes Sync, I have been able to download my iTunes music files. Music continues to play in background while working in other applications. BlackBerry Bridge turns your BlackBerry smartphone into a remote control for the PlayBook. If you have a touch screen BlackBerry, such as the BlackBerry Torch, it becomes a “Magic Mouse” for the Playbook. It also becomes a keyboard for the PlayBook. One feature carried over from the original PlayBook is the ability to sync your BlackBerry’s PIM (Contacts, Calendar, Notes) along with email and BlackBerry Messenger activity) to the PlayBook. BlackBerry Bridge does have one significant cost saving feature: I can connect to a wireless carrier via my BlackBerry Torch account and use the spare capacity available on my data plan without incurring additional data costs. Android Player currently allows one Android application to be running at any time; on the other hand all opened Android apps are in the player’s status bar (think Windows System Tray) and readily accessed and switched. Apparently the Android Player will become multi-tasking within itself in a future OS release. Another annoyance: at some point the Android Player will stall at its “initializing” screen and not go to a requested application; only rebooting the entire PlayBook fixes this. HDMI Connector: The PlayBook screen can be connected to a traditional HDTV set via the HDMI Connector. I have seen reports of combining this feature with video or movies stored on the PlayBook and BlackBerry bridge to use the BlackBerry phone as a remote control for watching a movie on an HDTV screen. Bottom line re hardware: the BlackBerry Playbook is an amazing hardware device. Combining the features above gives a taste of the potential of a true multi-tasking tablet; it’s a different user experience from that on the iPad and in many subtle ways more productive,. It even starts to give a feel for what the user experience can be on the forthcoming BlackBerry 10 using QNX. Applications: when it comes to applications, RIM has a huge challenge ahead to come to the level of what is targeted to be a fully competitive tablet. The applications can be divided into two categories: embedded applications on launching the PlayBook and third party applications. With the initial PlayBook OS 2.0 upgrade there were native applications such as a YouTube app, Adobe Reader, Facebook, Docs To Go (for reading and editing MS Office files) and Bing Maps. There’s a Camera app that takes both 1080p movies and 1024 x 600 photos using the 5MP rear camera (and works with the 3MP front camera). Video Chat does video and voice calling to other PlayBook users; great quality but very limited contact base. Of course it also includes the much anticipated “email client” – really a PIM and Messaging application that I have commented positively on earlier. The others are apps that provide some experience with the using the PlayBook hardware’s features but are not what one would call mainstream apps (other than Facebook and YouTube). Then there are the apps in BlackBerry App World: native QNX apps include Evernote, a couple of Canadian newspapers, a weather program and the popular Angry Birds. And somewhere around 15,000 vertical applications for PlayBook, including lots of games. As well it includes an Android Player which supports applications such as WordPress, Dolphin Browser and Zinio. iTunes Sync allows you to sync with iTunes on your Mac or PC (it does require installation of a Mac or PC client as well). Summing up: I can do email very effectively, browse almost any website, play music (in background), view and capture videos and photos. I can follow my Facebook activity, check the local weather and read newspapers and follow news and sports sites. Often where there is not an app, such as Dropbox, I can go to the application’s website and manage my files. In fact, with the speed of the web browser, it’s possible to go quickly to a website, such as CNN.com, New York Times and PGATour.com and access the same information I would see in a client application. As for connectivity between using my BlackBerry phone data plan and the availability of WiFi, there’s never been a connectivity issue. I’ve used it in New York City at my hotel and a Starbucks without incurring roaming data charges; I’ve taken it to my fitness gym and other frequently visited locations with the same experience. But it’s missing many major applications one would expect to see on a tablet such as Kindle, Dropbox, Four Square, LinkedIn, eBay, PayPal, Twitter, TweetDeck and all the Google mobile apps. (GMail, Google Maps, etc. are available via the web browser but it’s not tied into the GPS.) As mentioned earlier, I can readily and quickly access many of these applications through the browser. A major shortcoming is the lack of a Skype client. The irony here is that PlayBook’s true multi-tasking feature would allow Skype to port over all the features on the PC clients and let them run in real time while carrying on other activities. 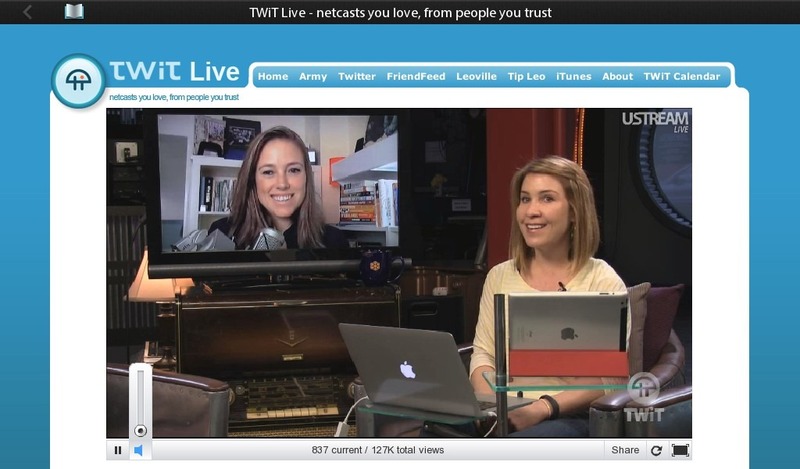 It can more easily deal with chat and presence issues that challenges Skype on current mobile devices. Rest assured, via Twitter and other forums (especially on those run by RIM and Skype), there has been lots of demand for Skype. But, beyond messaging, RIM needs to find the killer app that takes full advantage of its unique video, multi-tasking and browser strengths to appeal to users beyond its current user base. PlayBook is still a work in progress in many respects but it’s also building user experience and infrastructure leading up to the BB10 phone release. On the other hand, it works well for the applications and scenarios I have mentioned above. Until the application issues can be addressed and unique killer applications identified, RIM has a major challenge in penetrating the market beyond current BlackBerry users. And can they also convince the mainstream application developers that the potential user experience available through its unique hardware can make a difference to their market penetration and/or user experience? That’s the subject of another post. Not to be overlooked, of course, there are the business issues. That’s a topic that will be covered in a follow up post. As for my iPad, I’ll continue to use it as an “information delivery” device that sits on the coffee table or desk where normally one would find magazines and newspapers. It will also serve as a “desktop phone” supported by Skype and CounterPath Bria. And, if we could buy Amazon Fire in Canada, I would probably get one of them as well for reading books that are shared within the house amongst family members. We will continue to see many purpose-designed tablets addressing different vertical markets.